Boxing Scotland is delighted to offer members the opportunity to become part of an international network of clubs and organisations that support youth development through combat sports. 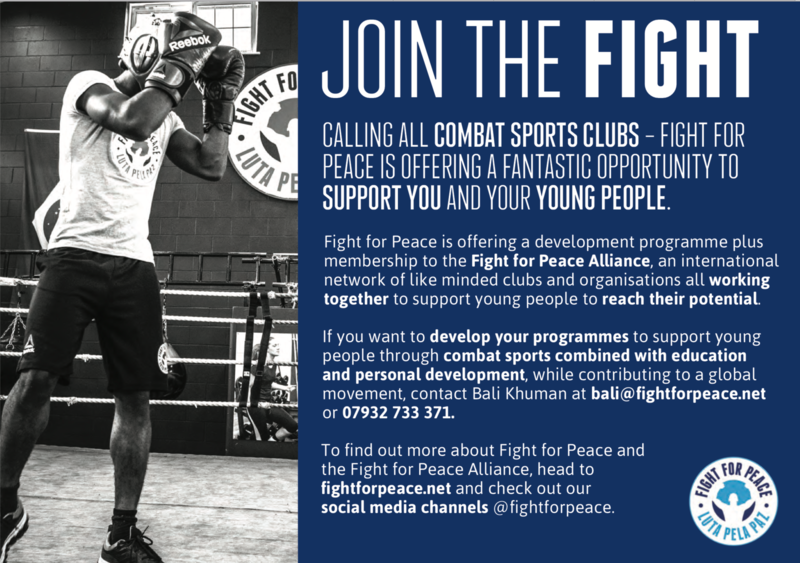 The programme supports Community Based Organisations (CBOs) in strengthening or introducing activities based on Fight for Peace’s Five Pillars: Boxing & Martial Arts, Education, Employability, Support Services and Youth Leadership. This combination helps to realise the potential of young people and to help support communities in areas affected by crime and violence and social exclusion. The application deadline is tight. Completed applications are to be submitted by Friday 15th February. Once applications have been submitted Fight for Peace will commence a selection process of all the applications. They will narrow down the number of affiliated clubs to between six to eight potential projects in order to allow the project to be more manageable. Selection visits will then be conducted in the final week of February. 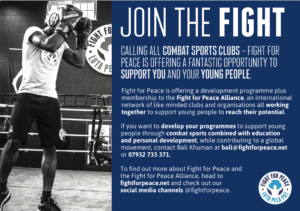 Fight for Peace will then offer these six to eight Boxing Scotland affiliated clubs the chance to send two representatives to receive five days of free training on the Fight for Peace methodology. This training will take place on the week beginning April 1st 2019 at the Fight for Peace London Academy in Woolwich, East London. All costs for travel and accommodation, as well as breakfast and lunch, will be paid for by Fight for Peace. After completing the training, clubs will also be given 12-months of consultancy support to help them adapt Fight for Peace approaches in their local area, in addition to becoming a member of the Fight for Peace Alliance which currently has members from 18 countries worldwide. For further information, you can visit Fight for Peace’s website at www.fightforpeace.net or call Bhaltinder Khuman on 07932 733371. Alternatively, you can contact Boxing Scotland’s Development Officers, Ben Holme (ben.holme@boxingscotland.org 07702 866135) or Paul Coleman (paul.coleman@boxingscotland.org 07803 513699). Links to required Documents are below.